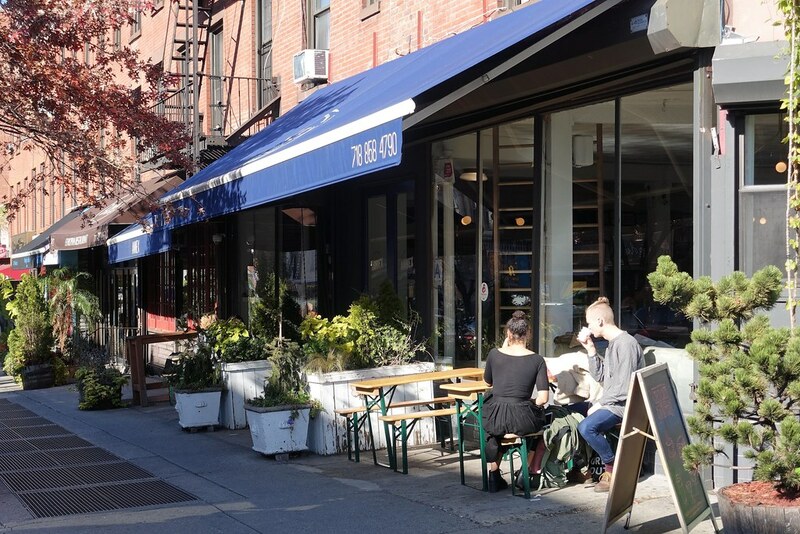 Sitting astride the Lafayette Ave subway entrance at the sharply-angled corner of Fulton Street and S Portland Ave, Greene Grape Annex is one of just a few specialty coffee shops in Fort Greene and caters to a wide cross section of the local population. Open late, they offer a full array of drinks: coffee during the day and local-focused craft beer, along with wine, and a full cocktail menu later on. In addition to morning baked goods, there is a cooked food menu which switches from breakfast dishes to lunchier items at noon and is served until closing, 9pm most days, 10pm Thursday through Saturday. 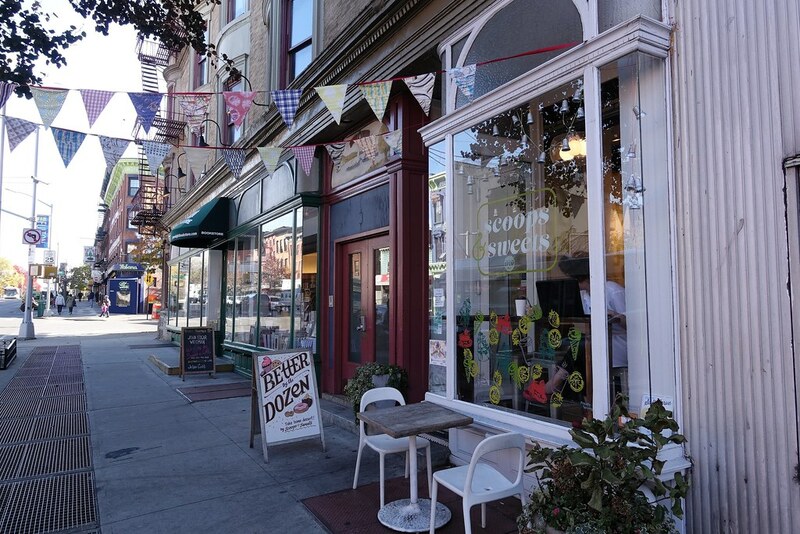 Greene Grape Wine & Spirits, a few stores away on Fulton St, was the local conglomerate’s first business and provides the Annex’s wine, while the recently-opened Scoops & Sweets across the street supplies baked goods made from local and seasonal ingredients. The organization also runs a Provisions shop adjacent to their wine store. 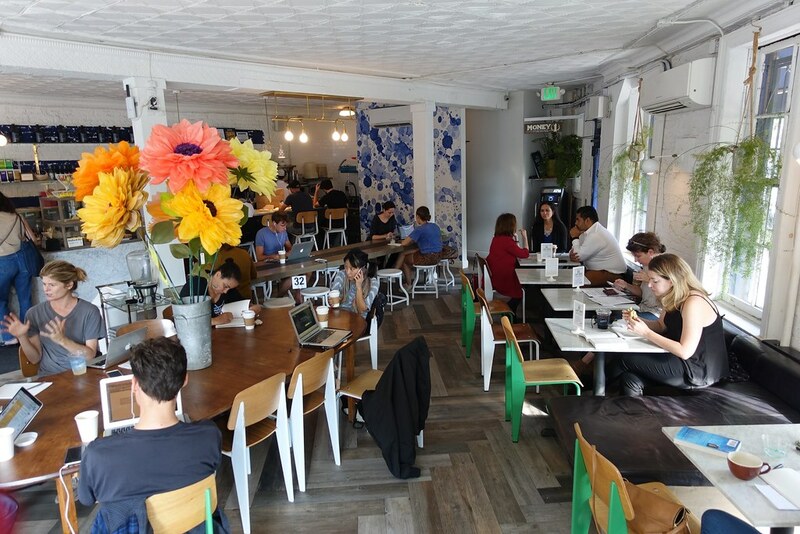 Computer-wielding customers, of which there are a huge number, are welcomed with open arms at Greene Grape Annex, which allows laptop users at a long, low, rectangular table near the bar which seats 14 on two facing rows of low metal stools, a more comfortable oval table near the door that holds another 10, but without the giant power strip afforded to the long table, and on a handful of counter-height stools facing onto Fulton St.
Two floor-to-ceiling newspaper and magazine racks, empty these days, flank the entrance to a raised, corner living room nook complete with four coveted, armless leather chairs and love seats. There are plugs here as well, and laptop users are welcome, as well as non-combatants, although the area can become uncomfortably hot and bright at certain hours when sun floods through full-height windows. Greene Grape Annex wisely sets aside space for people who just want to read, eat, study, or talk with their friends, banning computers from both the bar and the line of tables situated along the S Portland Ave wall. Picnic tables on the Fulton Street side provide outdoor seating, weather permitting. 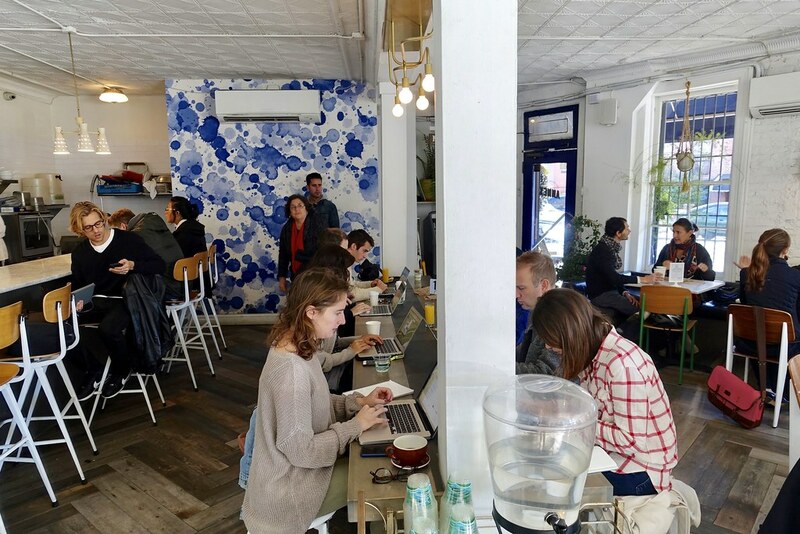 This seating quantity and variety engenders a lively atmosphere, where people show up knowing they can usually find a seat and have access to locally sourced food and drink catering to a variety of price points, dietary needs and tastes. 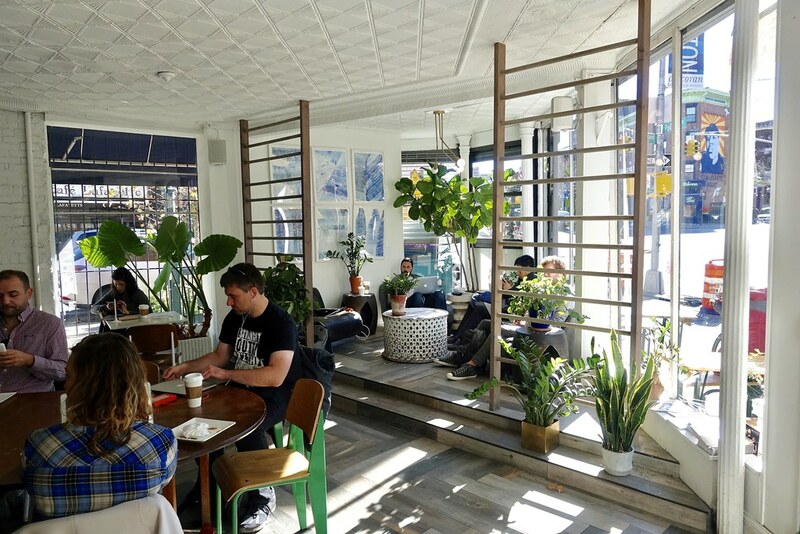 At nearly any hour of a weekday morning there will be a line of people running from the counter to the front door for Cafe Grumpy espresso drinks or Oslo drip coffee. 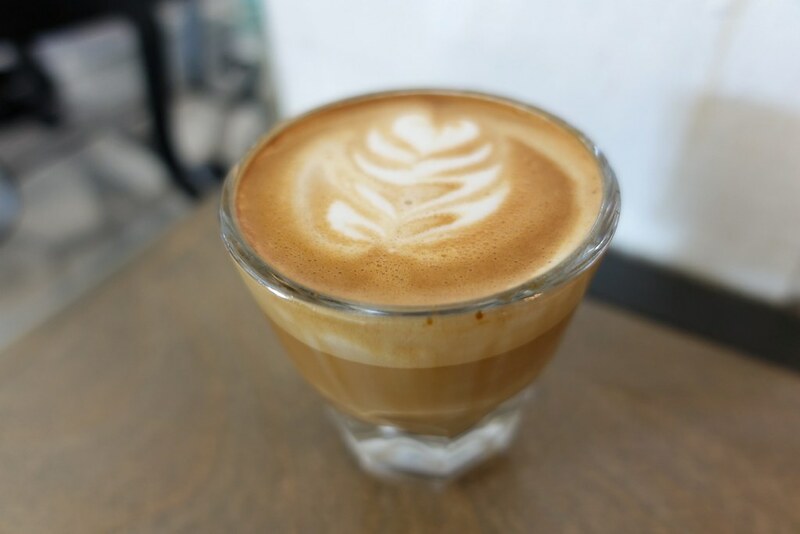 Considering the high volume, they do a decent job with consistency and quality on the espresso, but the cold brew is harsh and woody, and the drip coffee is nothing to write home about either. 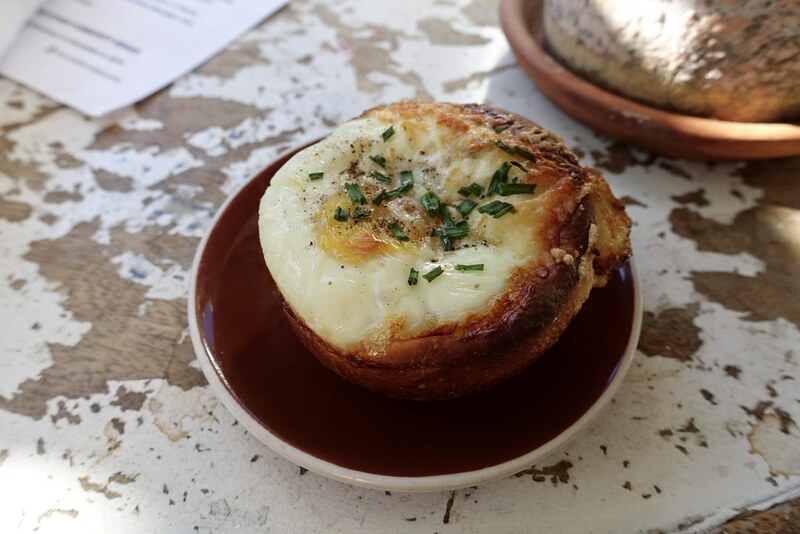 While the quality varies, the pastry case is homegrown and more creative than the standard paint-by-numbers coffee shop selections, populated with standbys such as biscuits and scones and more interesting fare including toad in the hole and ricotta cake with fig. 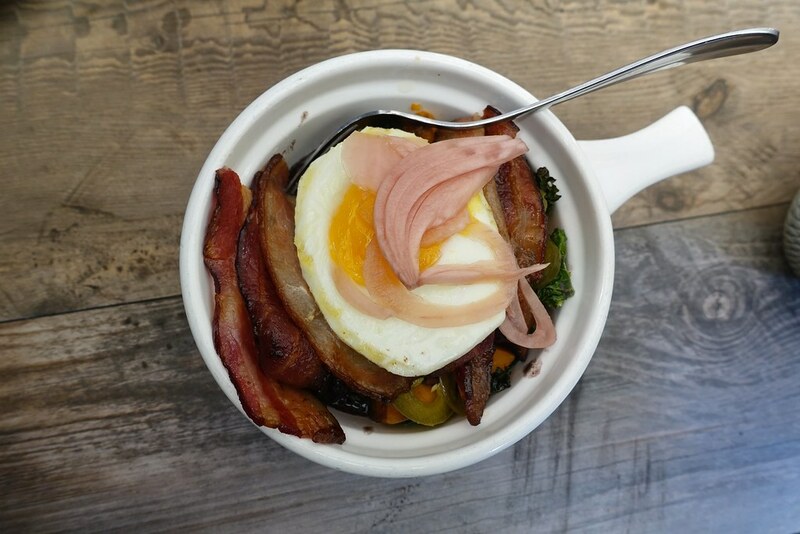 All are produced in-house or by the Green Grape-owned Scoops & Sweets directly across Fulton St. Cooked food is generously-portioned and satisfying but not particularly creative; the breakfast bowl is something you might whip up at home with leftovers and an egg. 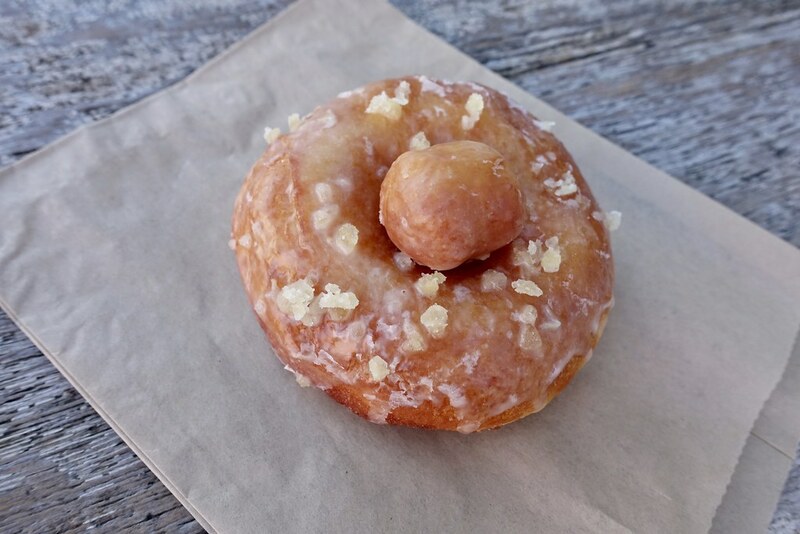 Their doughnuts are special – a recent specimen presented a chewy texture complemented by a rosewater-flavored light sugar glaze. It’s a rare baked good that I won’t consume down to the last crumb, but the cheddar chive biscuit I procured appeared to be lacking an ingredient and wasn’t cooked through to boot. A purchase every 1.5 hours keeps the wifi gravy train rolling, although there is an option for a half an hour of advertising-supported wifi – both options are fast and generally trouble free, although sometimes staff exhibit irritation during wifi transactions. The soundtrack is … soundtracks — oftentimes nerve-wracking, abrasive versions of said art form. It’s usually better in the early morning when they play more normal tunes, at a lower volume, but when the shop becomes jammed as the day rolls on, and the general noise level rises, the music can become intrusive and grinding. Open late, they allow laptop users late as well. Service is generally friendly but not necessarily personable – the high customer volume probably makes it difficult. 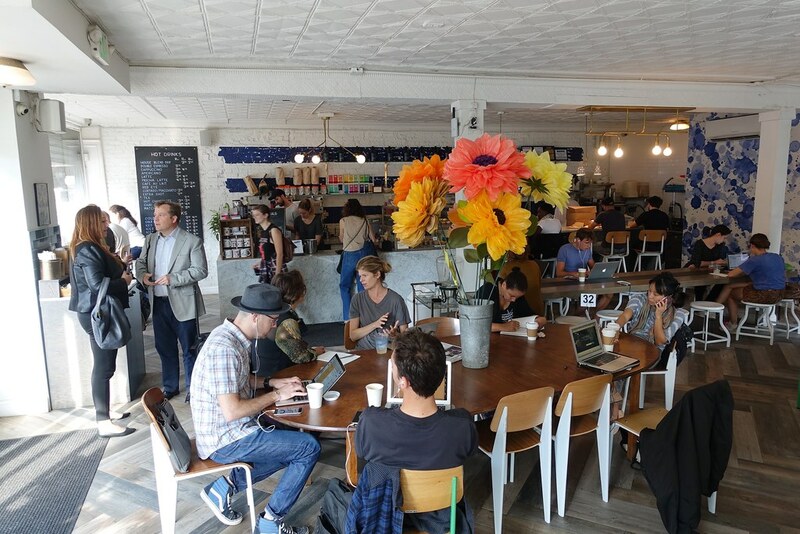 Although not a specialty coffee destination for me, Greene Grape Annex’s espresso is good enough to make me choose it as a work space whenever I’m in the neighborhood, given its other positive qualities.